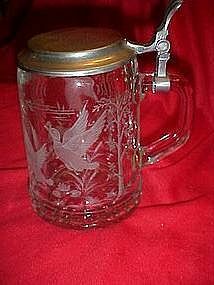 A very impressive lead crystal beer stein with an all around cut design of ducks in flight in the marshes and trees. So very lovely. Solid pewter top. Measures 5 1/2" tall. Pristine condition. Would make a very special gift.